Officials in Melbourne, Australia plan to cool the city by planting 42,000 trees. Melbourne, Australia, is getting hotter – because of a warming climate, and what is known as the urban heat island effect. Buildings, sidewalks, and streets all absorb heat and make cities hotter than the surrounding countryside. In an effort to cool the city, officials have begun planting trees. So far, they’ve planted twelve thousand toward a target of forty-two thousand. Melbourne Councilor Arron Wood says this urban forest strategy was developed during record-breaking heat, a 13-year drought, and more intense rainfall events. With ongoing global warming, this extreme weather is expected to intensify. In addition to cooling the city, the growing trees improve the soil and help absorb heavy downpours – which diminishes flooding. And it’s easy to gain public support for tree planting. Considered one of the world’s most livable cities, Melbourne aims to stay that way – with the help of the trees. Reporting credit: ChavoBart Digital Media/Julianne Warren. 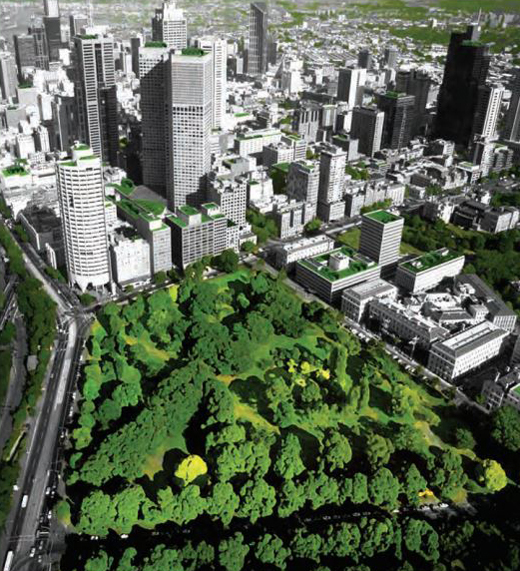 Photo: A visual of the possible future “greening” of Melbourne (source: Urban Forest Strategy: Making a Great City Greener (2012-2032).